The shortest month of the year is almost in the rearview and we’re already rolling with the March Sketch-y Friday reveals at ScrapMuch? Since this is our first March reveal, it’s a 2 page layout to start the month! 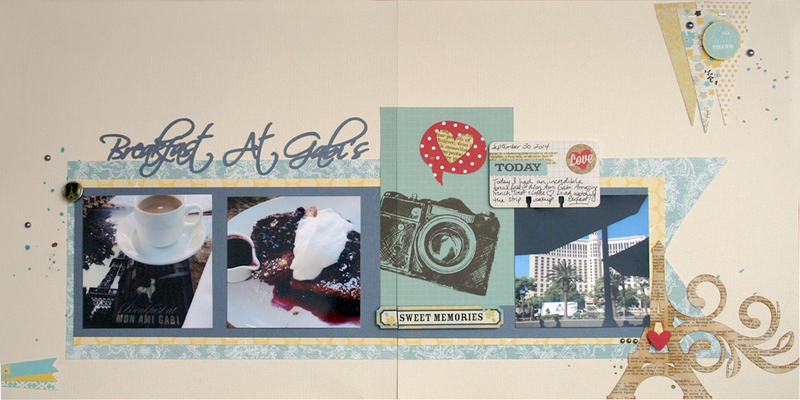 Today’s layout features a spectacular breakfast I enjoyed on my last trip to Las Vegas at Mon Ami Gabi. They have amazing coffee, my blueberry french toast was incredible, and so was my patio view as I watched the strip slowly wake up. I’ve had dinner on the patio at Mon Ami Gabi on a previous trip and it was a treat to watch the Bellagio fountains and people watch, but breakfast has an entirely different feel. Both were amazing though. The reason for all the Eiffel Towers on my layout is because Mon Ami Gabi is at the Paris hotel. Supplies Used: Cardstock-American Crafts, Bazzill Basics; Patterned Paper-Heidi Swapp, Stampin’ UP!, Teresa Collins; Embellishments-Simple Stories, Teresa Collins, Fancy Pants, Basic Grey; Mist-Tattered Angels Glimmer Mist; Tim Holtz Tiny Attacher; Silhouette Cameo; Tim Holtz Distress Ink. I even have a few fun detail shots for you this month! I cut the Eiffel Tower with my Silhouette using some Teresa Collins dictionary paper patterned paper. Since the paper was really stark based on the rest of the palette I just inked it up. Another fun Eiffel Tower brad from Teresa Collins that I cut the “wings” off and just pop dotted the brad. And now it’s your turn! Hop on over to the ScrapMuch? blog and see what the rest of Team A has created for your inspiration. Then create your own and make sure you link up and share with us by the end of the month for a chance to win an awesome ScrapMuch? prize. 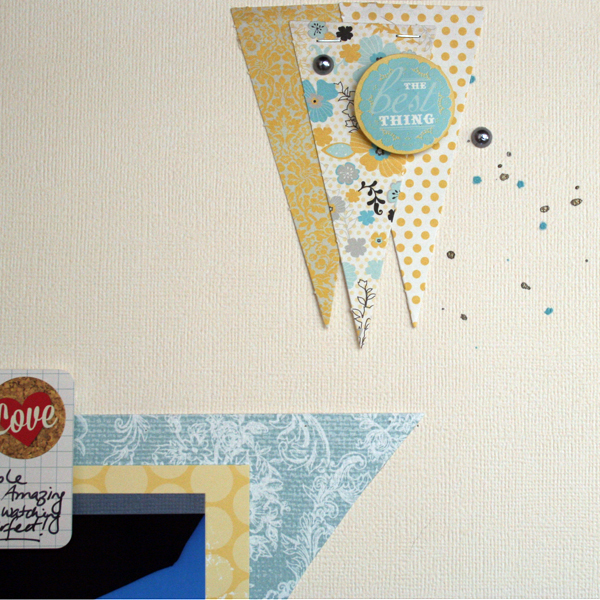 Love you banners….love the Eiffel tower….love the papers you chose! I love it all! Fabulous layout Tiiu! Wonderful double pagers! Love your triangle banner! Love your Eiffel tower being flourished! Looks like a wonderful place too! 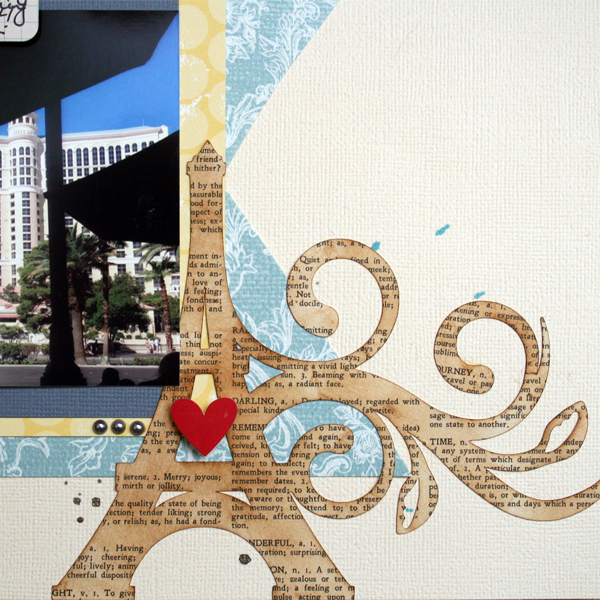 Fabulous double pager….love the Eiffel tower silhouette! 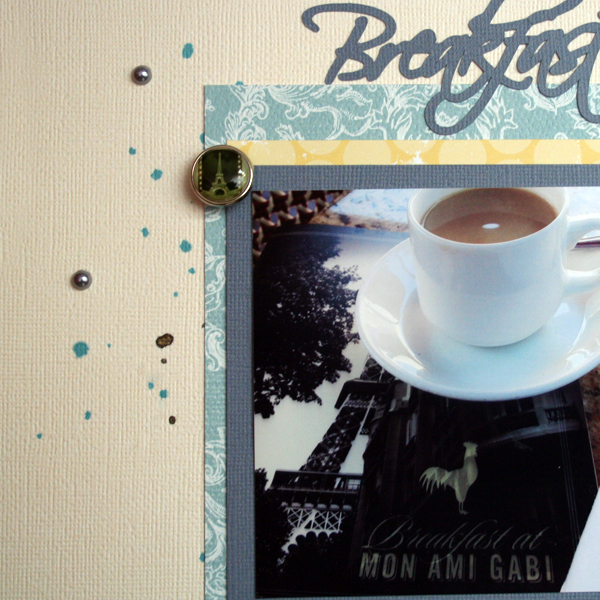 Great page, love the products that you blended together so well and the fab cut file! I like the way you used the 4×6 camera card and those cut files are great. I also like the fun journaling card.